The Seinajoki Crocodiles claimed their semi-finalist spot, winning against the Eidsvoll 1814s on a beautiful day with about 1500 spectators. Crocodiles get away with a win in the scandinavian battle. 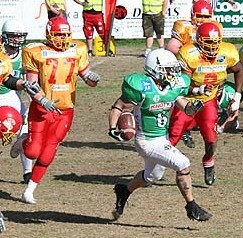 The game started off bad for Eidsvoll, having a 50 yard run against them, resulting in a touchdown by the shifty Mike Bolio. Eidsvoll didn’t get any rythm going during the first half, and the teams went into to lockerrooms with the score, Eidsvoll 0 – Seinajoki 7. Eidsvoll also got off to a bad start in the second half, as the Crocodiles once again capped off a good offensive drive with a TD run. Eidsvoll started to get some momentum builiding up, downing a punt a the 1-yard line, setting up the worse possible field postition for the Crocs. And the defense knew how to take advantage of that. Eidsvolls defense tackled the ball carrier in the endzone, resulting in a safety! The score was now 2-14, and Eidsvoll started to come back into the game. Eidsvolls first TD came on a good run play by Nordi Ben Moussa, 9-14 going in to the 4th quarter. The Crocodiles answered with a new TD, and the score was 9-22. Eidsvoll came back, scoring on a nice pass from Keldric Stokes to Alex Gillespie, 16-22. The last minutes of the game was nervewrecking, as the Eidsvoll offense had a chance to get into the endzone again, but could not execute. Seinajoki could run out the last seconds on the clock, knowing that they had a spot in the EFL semi final.